This article originally appeared in the curated site: www.deepculturetravel.com. Our Vietnam journey continues in Hoi An. A trading port established by the Portuguese in the 17th century, Hoi An is today a UNESCO World Heritage site on the banks of the Thu Bon River–about 800 buildings have been preserved, and many restored. So much to see here, from elaborate Buddhist temples to a 16th century Japanese bridge topped by a pagoda, brightly painted French colonial buildings, museum-like Japanese traders’ houses, Chinese temples, and more evidence of the town’s vibrant, multi-ethnic past. Among several museums, the Riverside Museum of History and Culture, housed in a 17th century pagoda, exhibits trader-era artifacts, fascinating old photos and rare ceramics. The circa-1650 Quan Cong Temple is dedicated to a Chinese general. You’ll recognize him—he’s the guy covered in gold, with a white horse by his side. The rain spouts in the courtyard here that look like carp are seen all around town. As do many tourists, in just 24 hours, we had some lovely silk clothing tailor-made for us by a local seamstress––pajamas, mandarin-collared tunic tops, and wide-legged palazzo pants. You can tour the town by cyclo, bicycle and on foot, take a cooking class, and relax and swim at nearby Cua Dai Beach (tours arranged through VIATOR). In the main Hoi An riverside marketplace and in street stalls, we shopped in a fair-trade craft workshop, and picked up carved wood and spices. We also bargained for a few of the (foldable) red, orange and gold paper lanterns that light up the streets at the night market. Our next stop, Hué is a European-looking city of wide, tree-shaded boulevards, laid out on both sides of the Perfume River. We stayed in a former villa owned by the Bao Dai, Vietnam’s last king, a wealthy and flamboyant lothario whose swan song played out in 1945, when he abdicated his throne to Ho Chi Minh (another of his vacation villas, now a museum, is in Dalat). After dark on a rainy night while the city’s electricity was down, the two of us rode snugly together in a cyclo—a three-wheeled bicycle rickshaw–and were pedaled through narrow, silent streets under dripping chestnut trees. Oil lanterns flickered on the noodle vendors’ tiny tables. Crossing a yawning moat, we bumbled through a stone gate and down a cobbled path lined with crenelated walls close enough to touch, and into the Citadel, also known as the Imperial City, built in the early 1800s under the Nguyen Dynasty, the last royal family of Vietnam. 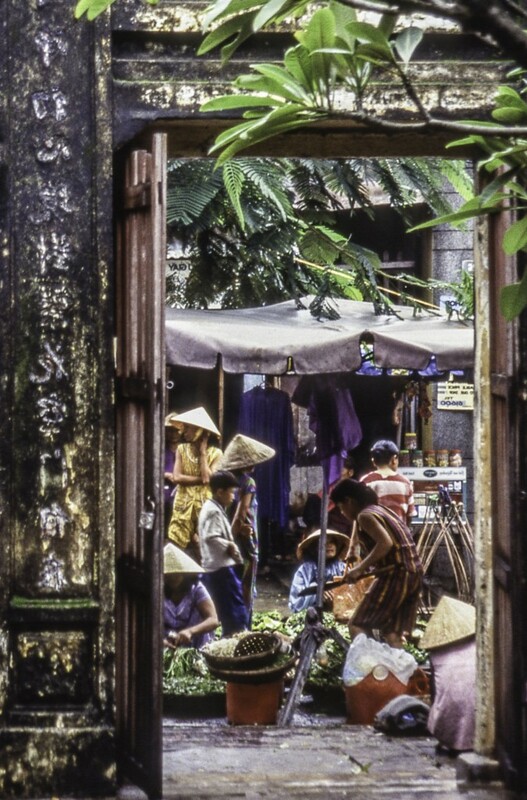 In 1968, the Viet Cong and the North Vietnamese army attacked and took over the city of Hué, destroying more than 100 historic structures in the Citadel, some of which have been restored. 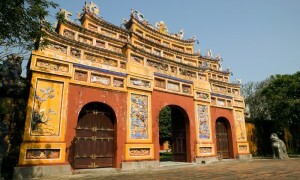 Today, it’s the #1 attraction in Hue, a UNESCO World Heritage site of palaces, ornamental gardens, temples, and statuary. Within the walls of the Citadel, we disembarked from our cyclo at a cafe where we dined on river fish and morning glory sauté in chili and garlic; delicately sweet shrimp rolls, and Tiger beer. Later, we stopped by a snake wine shop, where huge glass jars of rice wine were stuffed with various types of snakes, geckos and lizards. Only after several Tiger beers would you even think of looking at, let alone drinking, any of this wine. Long after dark, we boarded the rickety Reunification Express and hurtled north over the DMZ towards Hanoi, in a vintage train compartment right out of an Agatha Christie thriller. (From the Vietnam Railway System website: “On sleeper trains, cabins have four berths; a wash basin and communal Western and squat toilets are located at the end of each carriage. Pillows and blankets are provided and meals are sometimes served, but we recommend you bring your own food.”) Good advice. Through an early morning mist, Hanoi arose––a Communist outpost of gargantuan, faceless government buildings, gleaming new high-rises, and 1920s-era neighborhoods of small shops and restaurants. Repairing to the Kinh Do Cafe on Hang Bong Street in the old French colonial quarter, we drank café filtre and ate croissants, à la Catherine Deneuve, whose visits in decades past are remembered in photos on the wall. traditional ceramics, lacquerware, water puppets. and silk fabric and apparel. A must-see in Hanoi is the Vietnam Fine Arts Museum. From 2nd century Champa carvings to a 1,000-eyed, 1,000-armed goddess, contemporary art and vivid folk art, the collection here is the best in the country. Historic sites and museums devoted to the “American War,” as they call it here, are encountered all over the country and particularly here in Hanoi, where you can visit the Vietnam Military History Museum (complete with a statue of Lenin); Ho Chi Minh’s house and his Stalinesque mausoleum; and the Museum of Vietnamese Revolution. For a break from the cacophony of the city, we taxied to Hoan Kiem Lake for a walk on the tree-shaded trail around the lake. Frequent visitors and locals like the quiet hotels and favorite restaurants along the waterfront. While driving back to Hanoi, we saw a man standing on his roof, winnowing a basket of rice in the wind. We realized as we passed by that he was standing on the roof not to catch the river breezes but for the steady rush of air from his electric fan. He wore black pajamas and a Chicago Cubs baseball cap. Specialists in “insider” guided tours throughout Asia, Backyard Travel receives rave reviews in travel magazines and from their clientele. 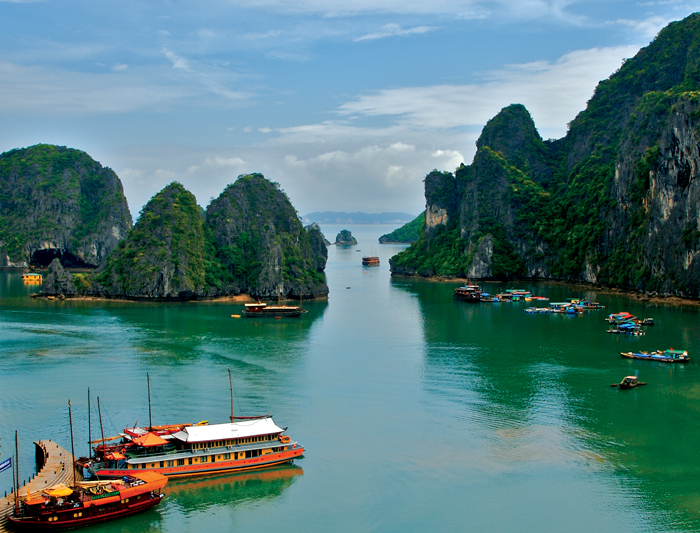 They offer a wide variety of Vietnam expeditions, from budget to luxury. Widely praised for their adventure- and culture-focused tours, Boundless Journeys caters to active travelers who like to walk and/or bike. Encounters with artists, farmers, chefs and historians are on the itineraries. 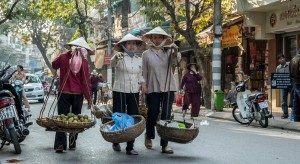 One of the world’s most highly acclaimed tour companies, also focused on active adventures, Butterfield and Robinson has a stable of experienced and beloved Vietnamese guides. I like their wide array of self-guided tours, like this biking expedition, with hotels and all logistics handled so you can just peddle around the country at your own pace. Secret Collections is an upscale agent/consortium offering luxury-level, independent, boutique accommodations, boats, villas, restaurants and more throughout Asia, including a lovely hotel in Saigon and a 26-cabin Mekong River cruiser. Related Article: See Here: Immersed in the Diverse Culture of Vietnam.